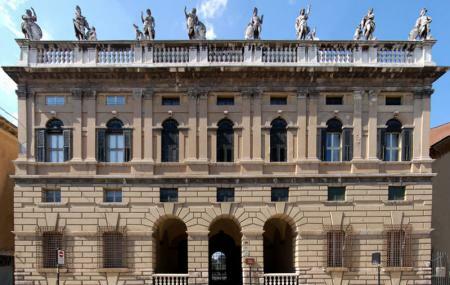 Built in between 1530 to 1537, Palazzo Canossa is a beautiful palace in Verona. The palace is constructed in Mannerist Style and is a magnificent piece of architecture. The palace was further enlarged in seventeenth century which included addition of two wings facing the river Adige. The top of the palace is adorned by finely carved ancient mythological sculptures that were perched there in the eighteenth century. The palace, in nineteenth century, was offered as accommodation to some notable figures like Napoleon Bonaparte, Tsar Alexander, Emperors Francis, Ferdinand and Francis Giuseppe. Visit this monumental palace to travel back in ancient times and observe the elegant age-old architecture. Love this? Explore the entire list of places to visit in Verona before you plan your trip. Fancy a good night's sleep after a tiring day? Check out where to stay in Verona and book an accommodation of your choice. How popular is Canossa Palace? People normally club together Church Of Teatini and Gurdwara Guru Nanak Mission Sewa Society while planning their visit to Canossa Palace. Where the place and legacy of the Canossa clan especially St. Magdalene of Canossa (our founder) lives on.. From Verona to Philippines she brought her motto, TO MAKE JESUS KNOWN AND BE LOVED..
Bellissimo palazzo del’500 in centro città, stile rinascimentale, costruito su progetto del Sanmicheli nel 1527. Ha ospitato personaggi celebri tra cui lo zar di Russia Alessandro I . La famiglia dei Marchesi Canossa ha una Santa: Maddalena di Canossa, orgoglio per la città. Qui si potevano ammirare statue del tardo ‘700, e magnifici affreschi di Tiepolo con un Trionfo d’Ercole, distrutto dai bombardamenti della Seconda Guerra Mondiale. Bel palazzo di verona. Mi piacerebbe visitarlo all'interno. Bellissimo palazzo antico con tante statue sulla facciata davanti. Il cortile interno affaccia sul fiume Adige.